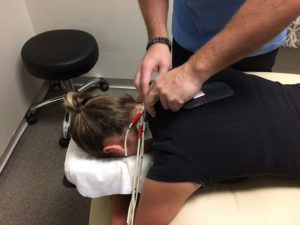 is a form of electrical current that is administered at the site of pain, soft tissue injury, swelling, post cast removal, or on some post surgical areas. Patients feel a slight tingling sensation like when your foot falls asleep. It should remain a pleasant micro massaging feeling and never be sharp, bitty or uncomfortable. You are in control of telling us when you have the proper amount of electric juice. 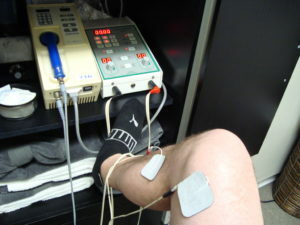 Your body may become accustomed the initial setting so you can ask to kick it up a notch half way through the treatment.